About Product : Each Vivarang has uniqueness with its own beauty and imperfections. Handwoven in Chattisgarh, Mashroo border handwoven on loom along with the dupatta, motifs woven with handloom jacquard technique of weaving with pure silk. The tribal belt of MP and Chhattisgarh is known for its scenic beauty much as its crafts. 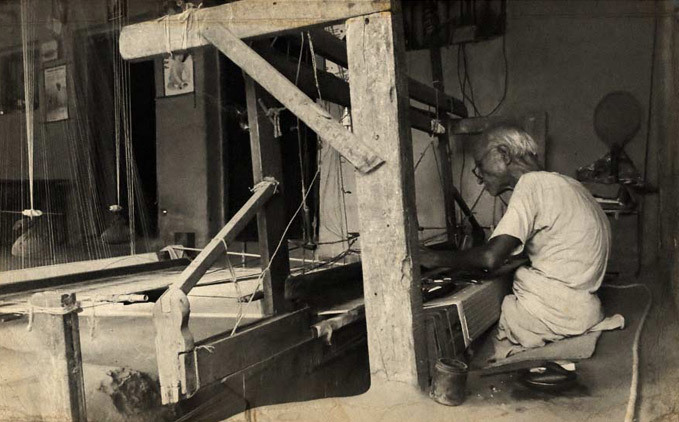 The region holds a long history of handloom in itself. The style originally belongs to the Marātha and Telugu castes of weavers of silk and fine cotton cloth. The area is known for its weaving in very fine counts - 80s to 120s. Amongst the merchants, the saris are known as ‘solah haath ki saadi’ or sari measuring 16 hands and Lugda. The Koshtis suppose themselves to be descendents of Mārkandi Rishi, who first wove cloth from the fibers of lotus flower to cover the nakedness of the gods. Stories say that in reward for this he was married to the daughter of Sūrya, the sun god and received a giant named Bhavāni and a tiger as dowry. But the giant was disobedient and so Mārkandi killed him and from his bones fashioned the first weaver’s loom. The tiger remained obedient to Mārkandi and the Koshtis think that he still respects them as his descendants; so that if a Koshti should meet a tiger in the forest and say the name of Mārkandi, the tiger will pass by and not molest him; and they say that no Koshti has ever been killed by a tiger. On their side they will not kill or injure a tiger, and at their weddings the Bhāt or genealogist brings a picture of a tiger attached to his sacred scroll, known as Padgia, and the Koshtis worship the picture. The saris earlier used to be only made of cotton woven into heavy, flannel-like fabric. The weavers have now moved to silk and cotton-silk too. 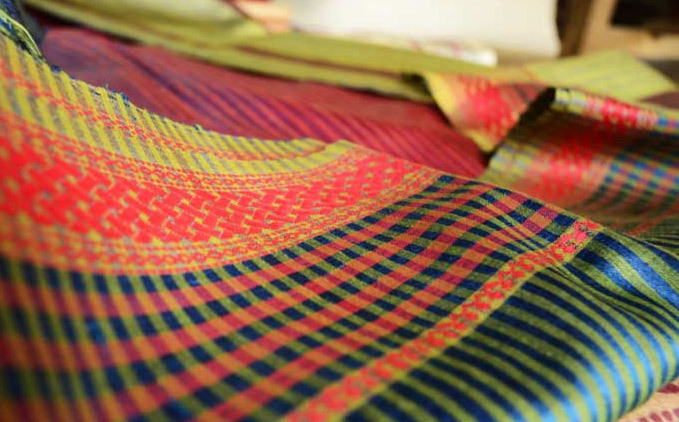 The woven cloth is made into saris, stoles, suit pieces, accessories and home furnishings. 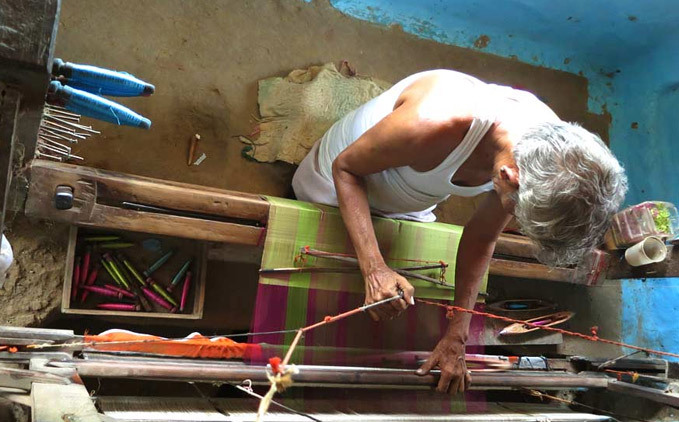 In recent times weavers also weave Chanderi and Maheshwari fabric in their looms owing to great demand of the saris… Tussar culture also provides high employment for both tribal and rural populations. Therefore, sericulture holds great importance in forestry as an added activity. 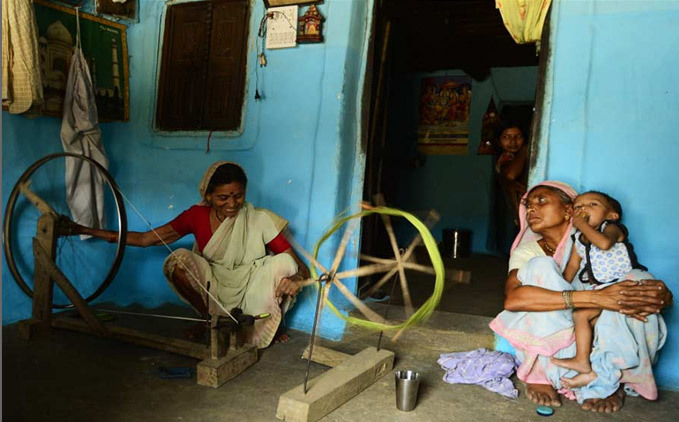 Traditionally spinning and subsidiary activities are carried out by women and weaving is done by the men. Weaving in this region is known to be happening for over 200 years. Raja Raghuji Bhonsle had taken over the Balaghat region during 1900 AD and the craft flourished under his patronage. Earlier the weavers used to make thin dhotis and Lugda only and used to sell it in the open markets. The weavers used to use 10s - 100s counts of cotton for weaving. From around 1920, they started weaving in only 10s and 20s. Heavy Maharashtrian influences are seen due to its proximity to the state. Initially, only cotton was woven extensively. As the demand and sale for the cotton fabrics reduced, the weavers started working on silk. From 700 looms, it has diminished to 70-80 looms. 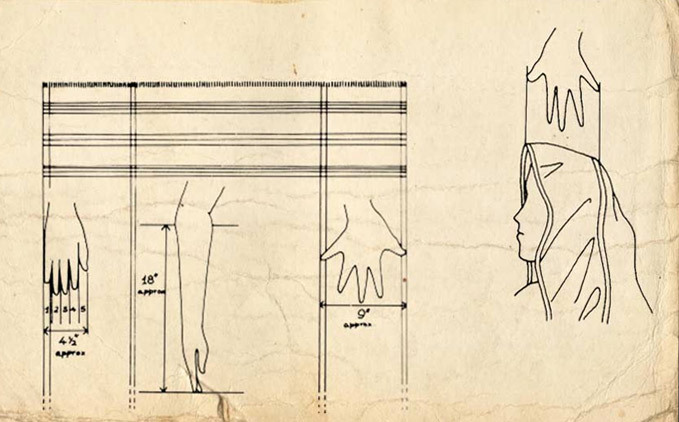 These saris have always been measured with the easiest tool available, the Hand. Making the measuring unit to be a finger or a hand, the borders or designs were called Ek ungal or one finger, Do ungal or two fingers, Teen ungal or three fingers, Char ungal or four fingers, Paanch ungal or five fingers, Ek bhitha or one hand span, Ek haath or one arm length from elbow to fingertips. There were a variety of body colors form deep maroons, haldi yellow to blue-black. The colors used in these saris are named interestingly; Purple - Baingani (Brinjal), Pink - Gulabi (Rose), Red-Brown - Eent (Brick), Pyaazi (Onion) etc. Others are Firozi, Mehndi (henna), Chutney (leafy green), Aasmaani (sky) etc. The borders and the body of the sari also have specific names. Nakshikinar is a flowering wine border. 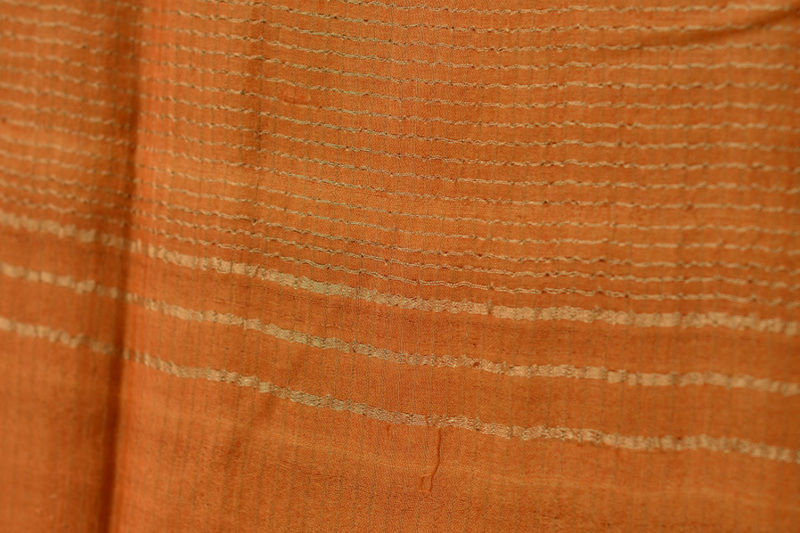 The sari is referred to as Selari if the body is striped, if it has variegated stripes, it is called Bhaga. 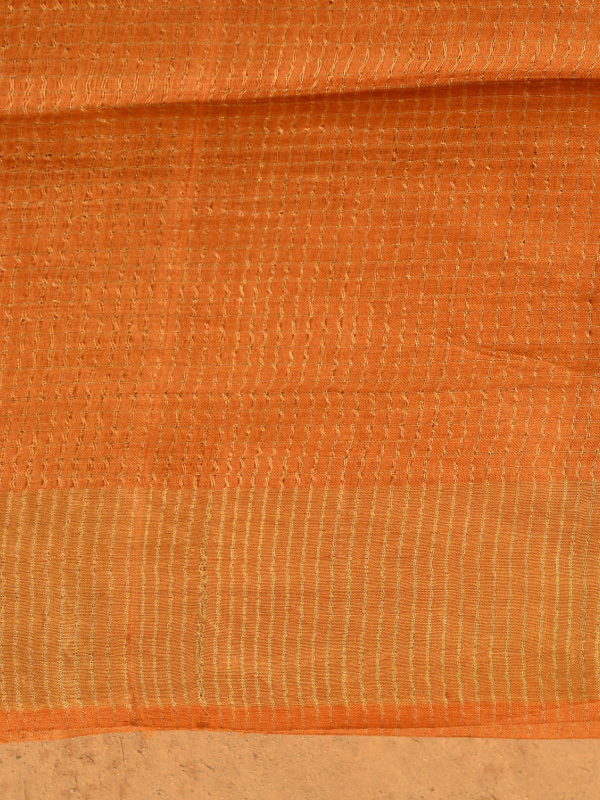 A sari with a 4X4 check pattern is called Moongia. 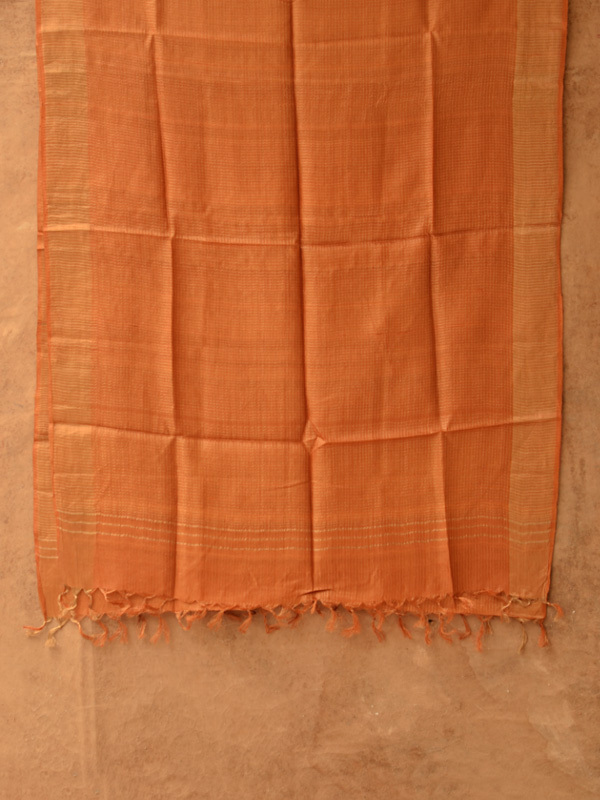 A sari with 2 X2 checks made using a two shuttle technique is called a Mukhtiya. 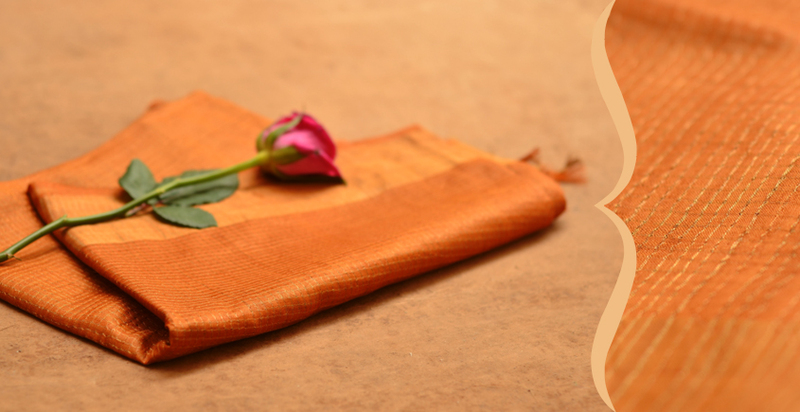 When the sari has two shades - a lighter and darker one it is known as Dhoop - Chaon. Warp border motifs are known after flowers - Ruiphool, Jai phool, Karvati or double Karvati (saw-faced motifs), Shahpuri or Gom (arrow-head pattern). The weaving is done on a traditional pit loom. 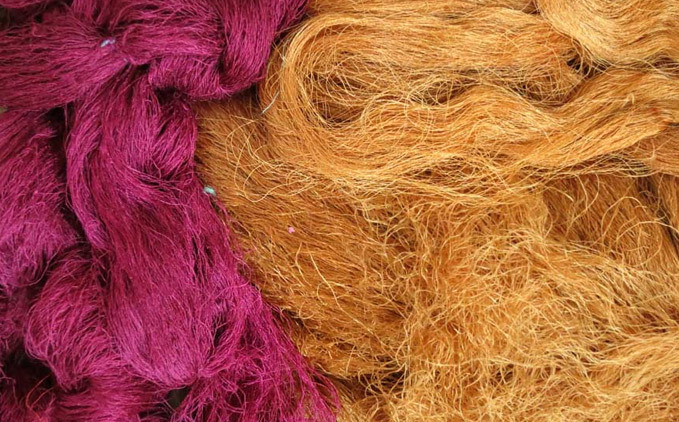 Specific warp yarns are raised in the process called Shedding. The weft yarns are picked and passed through the shed using a shuttle. The picking movement propels the shuttle by pulling the handle to let the shuttle move across to the other side. In the process of beating, the weft is pulled and tightened. Different textures of hand woven cloths are produced by varying the count of the warp and weft threads, the order in which the warp threads are lifted, and varying density or tension of the yarn. The land has varied elevations, thus creating various natural scenic spots like the valleys and cascading streams in valleys. The soil is suited for agriculture and is known to be very fertile due to dense forest cover. Teak, Sal, Saja, Bamboo, Neem and Mahua are commonly found trees. One can see this rich flora inspiring the motifs of its textiles through the history of handloom in the areas. The tribal belt of MP and Chhattisgarh is known for its scenic beauty much as its crafts. The region..